If you are interested in becoming a Timucuan Citizen contact us via e-mail at republicoftimucua@gmail.com. There is no fee for becoming a citizen of our tribe and nation. However there is a $20 U.S. dollar processing fee if you want a tribal ID card. We also ask that you include 2 passport size photos with your e-mail package along with the $20 US Dollars or T$15.00 Timucua Dollars for the ID Card. You may send the pictures for the ID as a .jpeg file attachment with your citizenship inquiry. Also you can pay for the processing fee via Pay Pal through the link below. 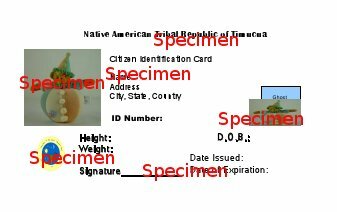 Also below you will find a specimen photo of our tribal identification card. The actual cards issued are very similar but aren't quite so comical in that they have your actual photo and signature on them. The specimen was selected to be comical to provide a little humor to this matter and to prevent an actual person's privacy from being invaded. All of our citizens should be aware that we consider your personal privacy to be of the utmost concern. Look at our Constitution. It is one of the guaranteed principles of our citizenry.